The Conspicuous Gallantry Cross (CGC) is a second level military decoration of the United Kingdom armed forces. The CGC was instituted in the aftermath of the 1993 review of the honours system. As part of the drive to remove distinctions of rank in awards for bravery, the CGC replaced both the Distinguished Conduct Medal (Army) and the Conspicuous Gallantry Medal (Air and Naval) as second level awards to Other Ranks and ratings. 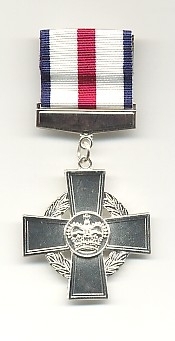 The CGC also replaced the Distinguished Service Order, in its role as an award to officers for gallantry (although the DSO was retained as an award for outstanding leadership). The CGC now serves as the second level award for gallantry for all ranks across the whole armed forces. The CGC, which may be awarded posthumously, is awarded "in recognition of an act or acts of conspicuous gallantry during active operations against the enemy". Bars are awarded to the CGC in recognition of the performance of further acts of gallantry meriting the award. Recipients are entitled to the postnominal letters CGC.